You have your own business, you consider yourself to be financially savvy, and don’t like to be bound by boring things like budgets. No problem, you can still have a thriving business without one… right? Even the smallest start-up businesses need to have a budget. Without one, you have no adequate way to measure how things are going, plan for the future, or make strategic decisions. Operating a business without a budget is like paddling out into the ocean and hoping the current deposits you on the tropical island of your dreams. Budgets are important for businesses of all sizes. Large businesses need detailed budgets to keep track of everything that is going on. And small businesses need to make sure that every dollar is working as it should to avoid financial disaster. That all sounds well and good, but where do you even begin? Stick with us, and we will give you some excellent reasons as to why your business needs a budget. If you don’t know where you are going, how will you know when you have arrived – or even if you are heading in the right direction? Part of setting up your budget is knowing where you want your business to be – in six months, two years, ten years and beyond. Your budget will help to drive your business forward for growth and success. Draw out the data from your business and break it down financially to create a yearly budget. This annual budget will roughly map out the direction you have to take to reach your goals. Once you have your direction in mind, you can track your earnings and expenses month by month to ensure you are on the right path. If sales are lower than expected, you can adjust your budget ahead of time to ensure your business doesn’t get into trouble. Or if profits are higher than expected, you can start planning for expansion or allocate that money to areas that might need it. That can be marketing, staff, increased production, or maybe even hiring a virtual assistant. Budgets give you the information you need to make critical strategic decisions in advance, so there are no nasty surprises at the end of the year. Can you afford to do all these things – or any? If you have budgeted correctly, most of your expenses will already be accounted for, but it is impossible to predict every variable when you run a business. Keeping an up to date budget, along with accurate financial records, takes care of the hard decisions. Look at your plan for the year and compare where you are now to where you want to be according to the budget. This will let you know exactly where you can afford to splurge, and when you need to hold back. It helps you to prioritise the areas you will spend in. Every business has low and high periods during the year – more so for seasonal businesses. That is why you need to account for these in your budget. If you have a go-with-the-flow mentality and spend all your profits during high season, you are going to be gasping for air during the rest of the year. Instead, you should plan for those peaks and troughs. Careful management and measured spending according to a well-thought-out budget gives you the breathing room to be comfortable all year-round. You can predict when will be a good time to hire staff, change premises, push sales, or launch a new product. You can also know when you should hold off on making any significant purchases or doing any unnecessary spending. In any business, it is essential that everyone is on the same page and heading in the same direction. Along with your mission and goals, a budget serves to clarify where the ship is headed, so everyone is rowing in the same direction. Sharing the budget with key managers and individuals within your business ensures everyone is aligned, and there will be no costly miscommunication. If you are looking for some financial help in the form of a loan or investment, you are going to need to show a strong track record for managing your business finances well. Before a bank or investor commits their cash to your business, they want to see that you have the discipline and ability to handle it. Being able to produce detailed budgets and financial records from the inception of your business to current day can attract the kind of investors you need to scale your business. A budget is a powerful tool to help guide your business to success. But it is not a “one-time-and-done” kind of deal. It should be a living business document. You need to refer to it regularly, adjust it, and compare it to your books to ensure you are on the right track. This can all be time-consuming and overwhelming, especially if you are not the best with figures. To avoid confusion and keep you moving in the right direction, consider outsourcing your bookkeeping or accounting. That way, you can get on with the essential work you enjoy, knowing that the backbone of your business is well taken care of. 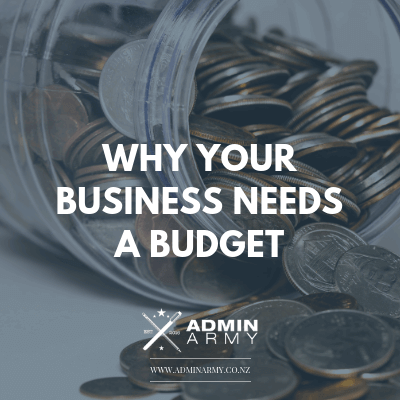 Admin Army are specialists in helping you work to a budget. We have a wide range of bookkeeping skills. Keeping everything up to date so you have access to essential financial information (like the ability to compare regularly how you’re tracking to budget) is one of them. Get in touch with us today to see how we can relieve the pressure of your bookkeeping, so that you can focus on what you do best.